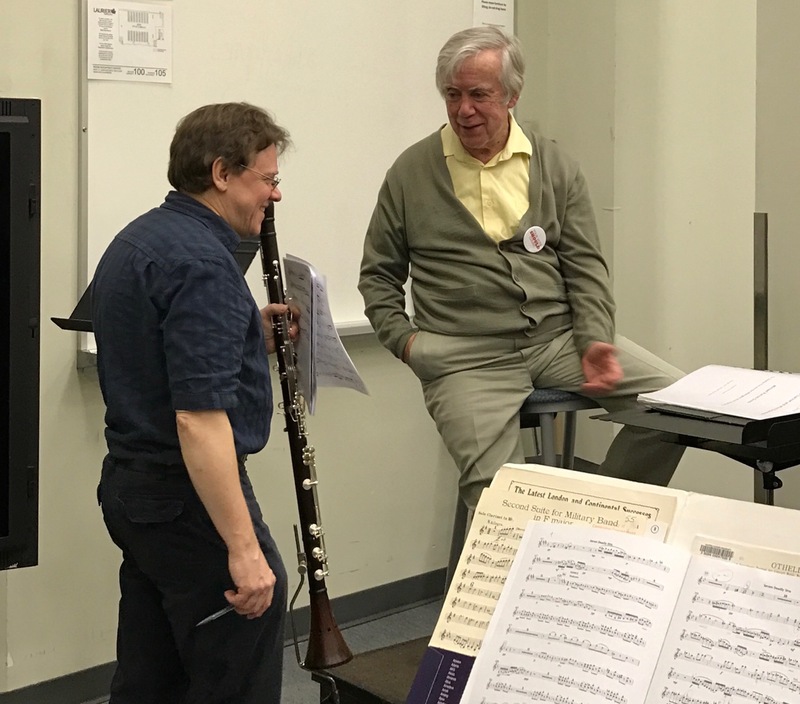 It is with heavy hearts that we share the news of the passing of Michael Purves-Smith, our music director emeritus and principal oboist. 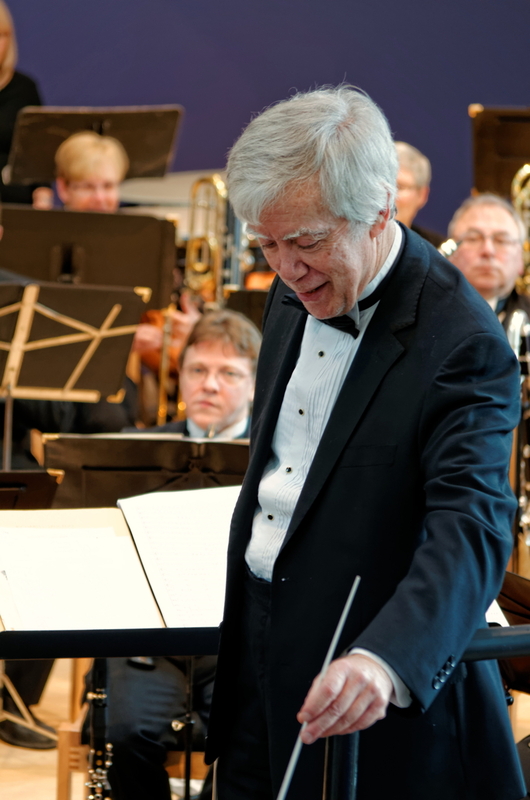 Michael was the soul of the Wellington Wind Symphony, and we are devastated by his loss. As Susan Follows so aptly puts it, “Michael was a connoisseur of life.” We remember Michael for his musical leadership, of course, but mostly we cherish the huge influence he has had on us all. Michael’s extraordinary musicianship, insatiable intellectual curiosity, and above all his humanity have been our inspiration. 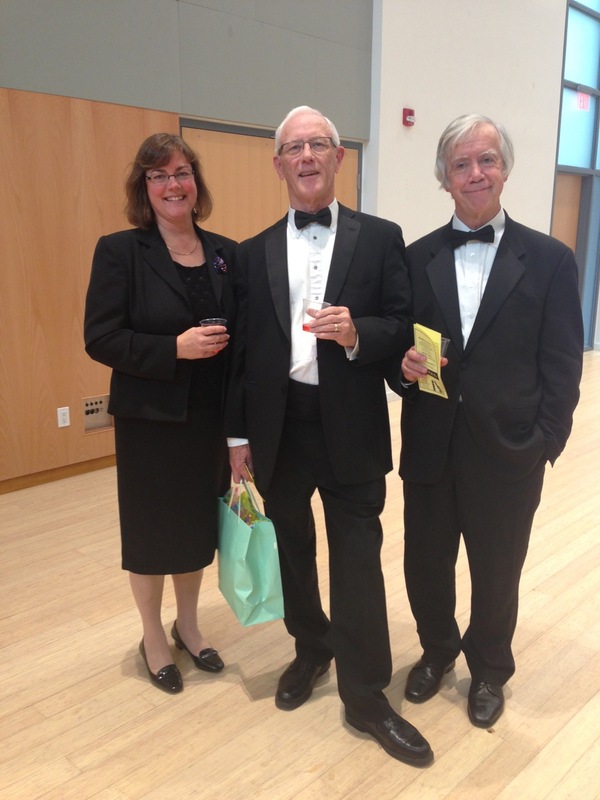 “He was “a gentle, beautiful man,” said Daniel Warren, who is the current artistic director of Wellington Winds. News of Michael’s passing has shaken the Kitchener-Waterloo and broader music community. We in the Wellington Wind Symphony mourn him as a member of our extended family. It is with love that we share these thoughts and memories from WWS members, in their own words. There was a room full of people with such sadness clearly etched on their faces last night. We are so sorry for your loss. Michael was a person who did so many wonderful and generous things with his time on this earth, all without the slightest trace of it feeding his ego, or building up his reputation in the eyes of the world. He was always gracious and humble. This to me is a person who has his priorities beautifully chosen. We all only have so much time on this earth and we can chase after superficial things, or we can see what really matters. Michael clearly saw what really mattered and worked to make it happen. I feel knocked down by the loss of Michael and then picked up by the memory of having known him. Its easy to assess the mark he has made on our orchestra- his musicianship elevated and enlightened us but he also improved us by his example. Michael’s soft-spoken intellect and commitment to all the “hot button” issues of our age serve all of us as a paragon of what we should strive for. He left with a lot of unfinished business – a testimonial to his curious mind and his dedication to trying to make this world a better place for all. To Shannon and the boys, I can only offer the love and support that friends do for each other. A long time ago, a much younger man, sporting a dark beard (in case some of the younger players are confused, we are not born with white hair. Some of us earn it!) stepped onto a podium and conducted the Wellington Winds ensemble. The events leading up to the search and acceptance of Michael, as our fearless leader, are a bit fuzzy now. Much water has passed under the bridge since then. But, at the time, who would have thought that this person would dedicate 25+ years of his life, of his musical life, to a group of community musicians. Through his own arrangements, we were introduced and treated to many other genres of music…to song, to the opera, piano and to the sometimes quirky arrangements of his own compositions. Our minds were set free from the standard band repertoire. We were treated to a smorgasbord of music. How many other bands can say that! May I suggest that we all raise a glass and propose a toast to acknowledge how fortunate the community, the Wellington Winds AND all of us musicians were/are to have been touched by Michael’s unselfish gifts. So many wonderful memories of Michael where do I begin? After I left the podium with the Winds there were a number of ‘guest’ conductors that kept the group alive and well. How ‘well’ may have been in question, however, and it was time to look for a regular MD to take us forward. I can’t remember whose idea it was but Michael (and Shannon) were relatively new to the area and it was thought that he might consider the gig. Well, not only did he consider it he became the embodiment of the Wellington Winds (named because we had our beginnings in Wellington County). The rest is a wonderful and colorful history. Michael took the group to new heights – inviting guest artists, writing and arranging so much music for us (sometimes handed out on the dress rehearsal) and generally inspiring us to be our best. He was a true Renaissance man – fluently bilingual, a taste for fine wines and good books and always with poignant thoughts about who we are as a species. He had a thirst for knowledge that left many in his wake. But mostly, he was a gentleman. Whether you agreed with him when discussing the wonders of the world or had a totally opposite viewpoint, he always respected your thoughts and seemed to soak it in and mull it around in his own consciousness. Discussions with Michael were never dull! Finally, he has left a legacy that will be with us for a very long time. His music, his writings and his musings will remain as a tide mark for the rest of us to aspire to. Thank you Michael – I will miss you. 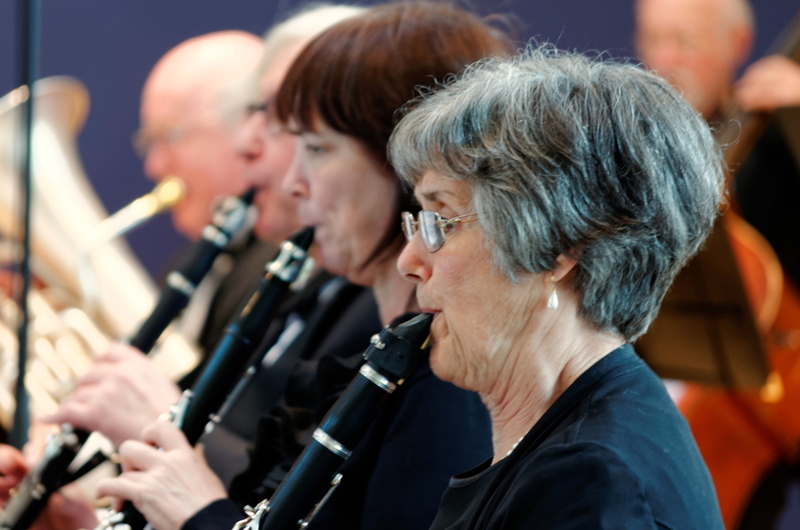 As a more recent WW member and having only a few white hairs I cannot relate old memories, but I will always remember from Michael his warm welcome the first time I joined the Wellington Winds, even if I don’t have a professional music background. He was always ready for a chat and loved it! It would have been interesting to discuss artificial intelligence with him. A big helper, from English review in my resume to baby sleigh … including my husband’s crazy project to write a music piece without strong composition background! And he was right, the apple strudels are just delightful, enough fat and sugar for a week, but tasty. We will never forget his precious contribution to our successful Canadian life. Our deepest sympathy to you, Shannon. We all know Michael was a great musician and a great person. One thing I liked about Michael was he always made you feel good and that you were important in your own way. He liked talking about gardening with me. Many years ago I used to talk to him at basketball practices when his son Robin and my son played together. He also liked talking about his travels and anyone elses. It is such a tragedy that he is gone. I am deeply sorrowed by Michael’s passing (way too soon). As an original WWS member, I remember his first appearance (1983?? – at a rehearsal in Guelph) as he had a very dark beard! And was an academic. Faintly scary. Our relationship deepened in more recent years, over quite a few beers and concerts. As I am one of the very few WW members to have a non-music scientific background, we got into quite a few arcane discussions, sometimes a bit heated. He was always concerned about the fate of the planet and the humans and life on it. He was concerned that uncontrolled curiosity had led humans to take over everything and had led us into our present very nasty situation. I would answer that to be human is to be curious and that to remove that trait would be unacceptable to me. But I had to agree with his unsavory basic premise. He was always concerned with the implications of future developments, particularly advances in genetic engineering. He hated the Perimeter Institute. Here we strongly disagreed – as I felt the goals there were philosophically especially relevant to being human. We discussed how stars work, Maxwell’s equations, finite elements, fusion, recently artificial intelligence and much else. Always stimulating. I remember a very recent event – only a couple of months ago – I was cycling home and a car pulled over ahead. It was Michael – and we chatted. He was upset that the environmentalists were totally against anything with “n” and he felt (and I agreed) that the real estate required for the standard solutions was excessive. He was always considering the future and its practical implementation. He was truly generous and human, in all senses of the words. Missed! A star has blinked out. I have many fond memories of Michael… How he loved to treat all of the bingo volunteers to apple strudel from the bakery, even though Shannon thought it was just an excuse for him to buy it for himself. How he would proudly tell me how many times he had been out cross-country skiing during the winter. His wonderful band arrangements. I particularly loved O Come, O Come Emmanuel. We will all miss him terribly. Apart from the all true observations you make about Michael, I would like to add that Michael, along with Shannon, have been wonderfully elegant, entertaining hosts. Those of us lucky enough to have been invited to their home, and I know there have been more than a few, will recall how welcome we were made to feel. We mustn’t forget Michael’s talents as an author and intellectual in the study of Rhetoric. Michael and I are the same age and have been musical colleague/friends since before the WWS began in 1981. We have shared many interests and experiences beyond music, including environmental and political activism. 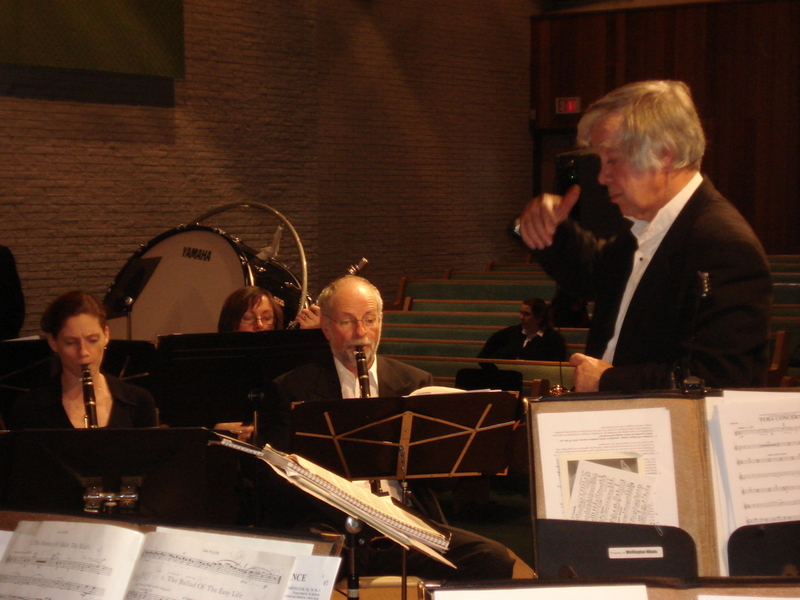 Michael’s support of many musicians and organizations, especially the Winds, is an example to be admired. His help and encouragement in my own efforts in transcribing and arranging have been invaluable. One of many memories will always be his choice of my Prokofiev Cinderella transcription to end his final concert with the Laurier Wind Ensemble. One of my fondest memories was in 2009, when Michael was planning the “Music is for Life” Symposium. I was organizing the high school student component and Michael was very supportive and encouraging. He truly believed that we need to involve our youth to help them see that music making can last a lifetime. As part of the symposium, high school students played alongside members of the Central Band of the Canadian Forces and students were invited to attend performances of Wellington Winds, community bands, and the composite band. Michael’s passion for community music making was contagious and his dedication to what he deeply believed in, was inspirational. 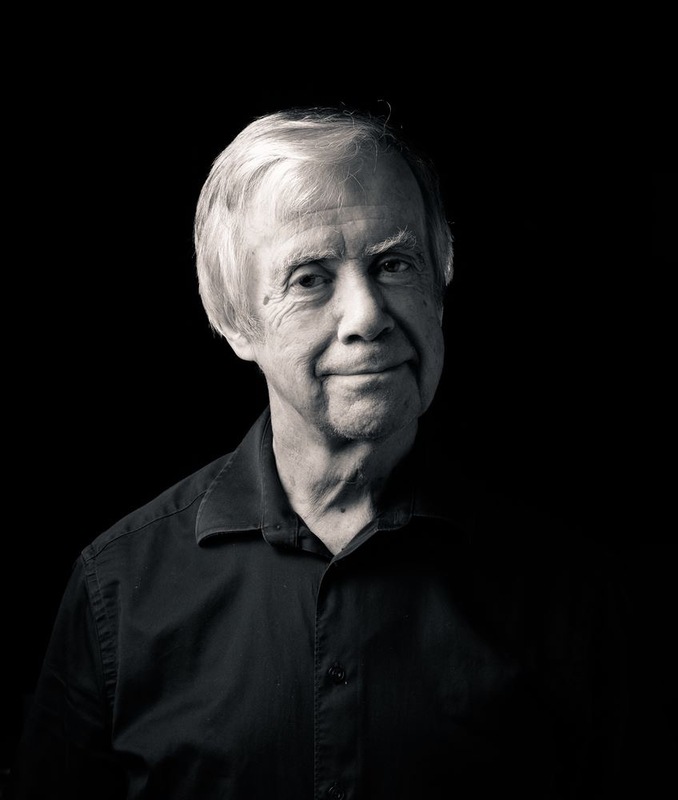 Michael really did have a huge impact on community music making in Waterloo Region and beyond, and he will be greatly missed. A few stick out in my mind, on a specific level, at my very first Wellington Winds rehearsal in 2005, I remember being in awe of how intelligent and eloquent the music director was. He was so very specific in what he needed and wanted musically and was able to communicate this, in his soft-spoken manner, in a way that was respectful yet helpful in achieving the effect he was looking for. Fast forward to his retirement celebration from the Winds in 2010, it is on this occasion that I had probably my longest non-musical conversation with him, and when I truly felt the passion he had for the planet. I remember the way he took the time to truly listen to my views and my experiences working for the Government of Canada on their Climate Change initiative education program. He was very curious and so very attentive. He asked me how I was at every rehearsal and was truly interested in listening to my response, definitely a gentleman, mentor, teacher and friend.I am honoured and blessed to have known him for a short while. Shannon, my heart goes out to you and your family, take comfort in the love and compassion of your friends and family during the difficult days ahead. David and I have known Michael and Shannon since we played in the St. Catharines Symphony together many years ago…before their time with the Wellington Winds! We will miss him terribly. Here, I want to pay tribute to Michael for his dedication and commitment to community music in the Stratford area. 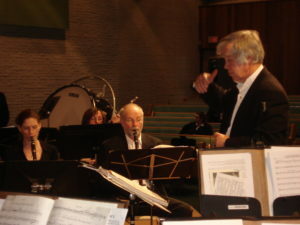 When the Stratford Concert Band was between principal conductors, Michael stepped in and lead the group for two years. As I’m sure you can imagine, he expanded our repertoire and expectations of what a concert band can do! The Stratford Symphony Orchestra also is indebted to Michael. A number of years ago, we were suddenly in need of a conductor. Michael stepped in and conducted a brilliant Proms Concert for us…complete with Britannia leading a singalong which included “Land of Hope and Glory”! Michael’s musical talents and creativity as well as his passion to help others will long be remembered. 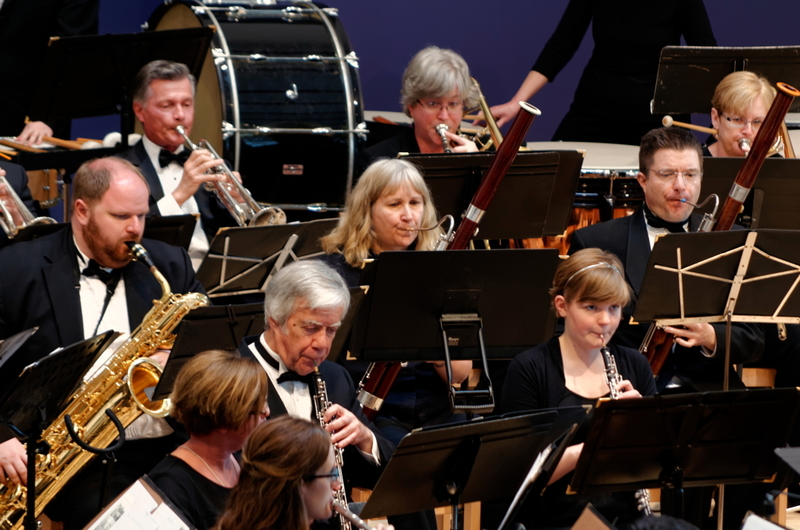 It was a privilege to play alongside Michael in the Winds, and always a treat for me when he conducted, as it brought back memories of WLU Wind Ensemble in the 80’s. I have many fond memories of Michael from Laurier, including staying for much of the weekend with a couple of other composition students in Michael’s office, copying last-minute parts for a premiere – I think it might have actually been a piece for Wellington Winds. He paid us by the hour, but the real reward was all we learned from his music and his gracious company through those long hours, and later over Chinese food down University Avenue. Another time, he asked me to help out for a Baroque Ensemble concert by joining the dance troupe. As a saxophonist/composition major with no dance background, I couldn’t have been more of a fish out of water with the Baroque dancers, but I said yes, because it was Michael and he needed the favour. It turned out to be a fantastic experience. I’m sure that he has touched the lives of thousands of other musicians with his soft-spoken wit and exacting musical standards, his kindness, and his generosity. Michael was a true gentleman and we are all richer for having known him. I remember sitting around Shannon and Michael’s dining table one December night, sightsinging SATB hymns. I think there may have been wine involved. I’ll remember Michael as a generous man with a great sense of humour, even in the tense, under-rehearsed moments before the downbeat. No doubt it was these qualities that got us through some pretty fine concerts. Michael was a connoisseur of life. He had so many passions -his wife, his boys, early music, new music, Wellington Winds, food, wine, language, hiking, snowshoeing, the environment, writing, ideas and people! He constantly amazed me with his vast interest in so many things. I am so glad that Michael and Shannon were able to celebrate their 50th wedding anniversary together this past August. We are all richer from knowing Michael and we’ll remember him wherever there is music. This tribute is dedicated to Shannon Purves-Smith, Michael’s beloved wife, a member of the Wellington Wind Symphony herself, and part of our musical family. We are so sorry for your loss, Shannon and send you our love.